Donald is one of the main characters of the Kingdom Hearts series,, the court mage of Disney Castle, and one of Sora's two companions. Donald is stubborn and sometimes blunt and rude, but he is also fiercely loyal, spending the entirety of the first game determined to carry out King Mickey's orders and later breaking his oath in order to protect Sora. 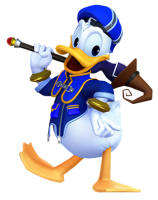 Donald is one of the only characters who appears in every installment of the Kingdom Hearts series.